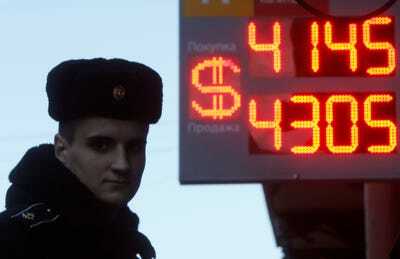 Alexander Demianchuk/ReutersA navy sailor looks on near a board showing currency exchange rates in St. Petersburg, October 30, 2014. Outside a high-rise building on the outskirts of this disputed region’s capital, a steady stream of frustrated residents exited a government office, clutching folders of bank records and shaking their heads in disgust. “They are not returning the money,” complained Margarita Pobudilova, a 77-year-old retired factory worker who for months has been unable to access more than $US3,000 of her life savings. Ten months after Russia invaded this Black Sea peninsula and seized it from Ukraine, the financial fallout is still being felt. Thousands of ordinary citizens have little or no access to their funds. Losses for Ukrainian banks continue to mount as billions of dollars worth of loans they issued in Crimea go unpaid. Lawyers for the banks are preparing legal actions against Russia, which confiscated many of the banks’ buildings, equipment and cash. Meanwhile, Crimea has been thrust into a kind of technological time warp: Most ATMs no longer accept non-Russian bank cards; foreign credit cards can’t be used to buy things. Most non-local mobile phones can’t receive a signal. And even if they could, calling other Crimeans is complicated: Most of the peninsula’s residents recently had to get new mobile phone numbers because Ukrainian services were cut off. The banking and phone chaos are another front in the conflict between Ukraine and Russia. In Crimea, which has been part of Ukraine for 60 years, Russia has basically blown up the existing banking system, forcing Ukrainian banks to close, banning the Ukrainian currency and replacing the region’s retail banking network almost overnight. The resulting economic turmoil has shuttered some businesses and complicated life for thousands, forcing people to deal with a Kafkaesque bureaucracy to try to get their money returned. For all the havoc Russian President Vladimir Putin’s conquest has caused, many living here don’t blame him for their hardship. In interviews, residents accused Ukrainian banks and the government in Kiev of stealing their money. That distrust indicates — at least for now — a victory for Russia in the propaganda war and suggests that Kiev’s chances of regaining the peninsula soon are slim. The international community has condemned Russia’s annexation of Crimea, with the United States and the European Union imposing economic sanctions on Russian individuals, companies and banks. Russia has retaliated with its own sanctions and support for pro-Russian separatists in eastern Ukraine. Andriy Pyshnyy is chairman of the management board of Ukraine’s state-owned Oschadbank, which until March had 296 branches in Crimea. He described how one day they were taken over by Russian banks. “In the evening (our) outlets work,” he said. “In the morning, a new bank is opened and just the name is changed to RNCB Bank.” Russian National Commercial Bank is one of at least 30 Russian banks that have rushed in to fill Crimea’s financial vacuum. Many in Crimea — where average monthly wages last year were less than $US400 — still can’t access their Ukrainian bank accounts. The situation was exacerbated in April when Putin offered Crimeans who had leased their cars through Privatbank, Ukraine’s largest bank, some unusual financial advice. The remark may have been related to an ongoing feud between Putin and Ihor Kolomoisky, one of Privatbank’s largest shareholders. Russia has accused Kolomoisky of funding Ukrainian battalions fighting the separatists. In any case, following Putin’s suggestion, thousands of individuals and companies that had borrowed money from Ukrainian banks stopped repaying their loans. 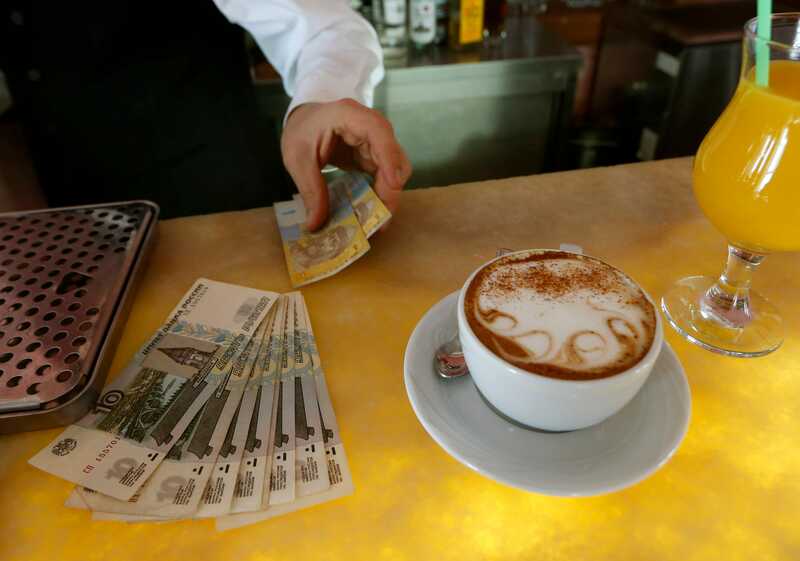 Vasily Fedosenko/ReutersA waiter counts Russian roubles and prepares Ukranian hryvnia for change in a restaurant in Sevastopol March 24, 2014. “If the ruler of the country told them not to pay, why would they pay?” asked Alexander Dubilet, chairman of Privatbank, which had lent more than $US1 billion in Crimea. In all, Ukrainian banks had loaned Crimean businesses and individuals about $US1.8 billion at the time Crimea was annexed, according to Ukraine’s central bank. Pyshnyy of Oschadbank says “99.99 per cent” of its loans in Crimea – which totaled more than $US500 million – are now delinquent. The surge in bad loans has made it more difficult for Ukrainian banks to repay Crimean depositors, according to an official with Ukraine’s central bank. The fact that the Russians also seized many of their branch offices and records didn’t help, either. “To function properly, we need … access to our branch network, our outlets, our ATMs, to our documents, our files,” Pyshnyy said. To help Crimeans, Moscow has been compensating depositors with accounts at Ukrainian banks through a fund that insures Russian bank deposits. According to the Fund for the Protection of Depositors in Crimea, which is part of Russia’s Deposit Insurance Agency, as of Nov. 6 it had paid out more than $US500 million to 196,400 depositors. The compensation is capped. Yevgenia Bavykina, Crimea’s new deputy prime minister in charge of economic affairs, told Reuters last month that depositors were owed more than $US425 million in part because the fund has a limit of about $US15,000 per bank account. Bavykina said the fund has compensated most people who have applied. In thousands of cases, however, it has had difficulty verifying exactly how much money was on deposit, she said. With no Ukrainian bank branches left operating in Crimea, the required verification records often aren’t available, frustrated Crimeans say. Pobudilova, the retired factory worker, had invested about $US3,600 in a one-month deposit at Ukraine’s Kyiv Rus Bank in February. By the time her investment matured, the Russians had invaded Crimea, and Ukrainian banks were being forced out. She said she has no access to the money because the bank blocked her debit card. She applied to the deposit protection fund, but was told it could not compensate her unless her investment contract with her bank was extended. The fund advised her to write to Kyiv Rus Bank. Her grandson, Vladimir, said she tried to contact the bank. “They did not even want to talk to her,” he said. Kyiv Rus Bank declined to comment. 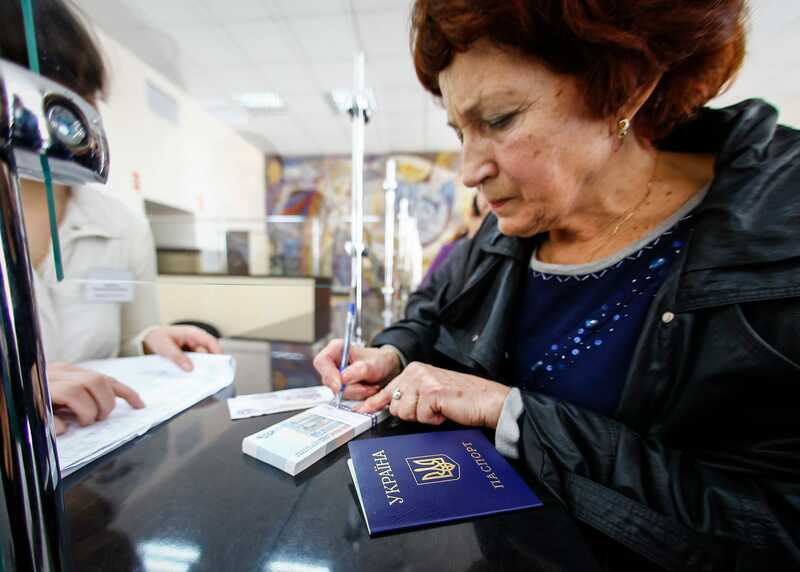 Shamil Zhumatov/ReutersA woman receives her pension pay off in Russian roubles in a post office at the Crimean city of Simferopol March 25, 2014. In another case, a retiree named Iryna, who declined to provide her last name, said she has no access to more than $US100,000 on deposit at Privatbank and has received no satisfaction from either the fund or the bank. She said her problems began with her passport. She has lived in Crimea for 40 years but had replaced her passport two years ago in Ukraine’s capital, Kiev, after the pages split apart. The new passport stated she lived in Kiev. After the annexation, she said, “I realised I was in trouble.” She said she spent months trying to change her passport to list her address in Crimea, eventually going to court. When she tried to withdraw her money from Privatbank, she said the bank only offered her a five-year savings agreement that paid 7 per cent annual interest — much less than Ukraine’s annual inflation rate. She said she refused. Privatbank said it could not comment on the specifics of her case without more information. By the time she won her court case and obtained an official document stating she is a Crimea resident, she said she had missed the deposit protection fund’s deadline for applying. Legally, Ukrainian banks are required to repay Crimean depositors because Ukraine does not recognise the Russian annexation, said Oleksandr Pysaruk, first deputy governor of the National Bank of Ukraine, the country’s central bank. But he said the hundreds of millions of dollars in delinquent loans make that difficult. “If you’re liable on the savings but the loans don’t get repaid, you’ve got a capital hole,” he said. Ukrainian banks’ policies towards their Crimean customers vary. Some give priority to Crimeans who have moved to other parts of Ukraine. But only 19,150 people out of a population of nearly two million have migrated, according to Ukraine’s Ministry for Social Policy. As for delinquent loans, Privatbank is continuing to charge interest; Oschadbank’s chairman says his bank isn’t. “We want to understand the position of the borrowers,” said Pyshnyy. Executives with state-controlled Ukrgasbank in Kiev, which had 11 branches in Crimea, said any of its customers there could travel to other parts of Ukraine and withdraw their deposits. By August, depositors had withdrawn 80 per cent of the $US25 million in funds on deposit. Pysaruk, the central bank official, said some Crimeans have tried to double-dip by seeking compensation from both the Russian fund and Ukrainian banks. “We don’t have numbers, but they were not just random occasions,” he said. How long that will take remains unclear. 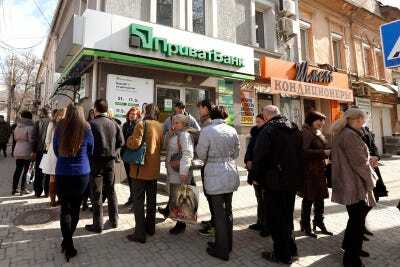 The Crimean protection fund said it has paid out more than $US250 million to 109,300 Privatbank customers. But Privatbank and other banks do not know which of their depositors have been reimbursed or how much. Privatbank chairman Dubilet said the Russians seized more than $US150 million of the bank’s real estate and equipment, $US30 million from its safes and another $US10 million from its ATMs. In April, Privatbank sold its Moscow subsidiary, saying it was the victim of “unprecedented political pressure” by Russian authorities. Dubilet said Privatbank hasn’t yet calculated its total losses in Crimea. He said its lawyers are considering legal action against Russia in several jurisdictions. Meanwhile, a Crimean court ruled this week that Privatbank owes local depositors $US232 million and should pay them back. Privatbank’s problems in Russia and Crimea appear to be related to a nasty spat between Putin and Kolomoisky, a billionaire businessman who is one of the bank’s largest shareholders. In March, after Kolomoisky was appointed governor of a region in eastern Ukraine, Putin called him “a unique imposter.” In telling Crimeans not to worry about car loans owed to Privatbank, Putin added, “If Mr. Kolomoisky and Mr. Finkelshtein don’t want your money, it’s their problem.” Boris Finkelshtein is the former head of Privatbank’s Crimea operations. Russian authorities later launched a criminal case against Kolomoisky, issuing an arrest warrant, confiscating some of his property in Russia and accusing him of organising and funding Ukrainian forces in the separatist conflict. The case remains open. Kolomoisky didn’t respond to a request for comment. The tensions between Kiev and Moscow will make it harder to solve problems like the one Ukraine’s central bank faces. The Russians did not confiscate the central bank’s building in Simferopol, but the bank has no access to about $US250 million in Ukrainian currency in its vault. Pysaruk, the first deputy governor, said the bank has held discussions with Russia’s central bank and while the Russians indicated they might be willing to buy the building and return the cash, no agreement has been reached. Calling the annexation of Crimea “a land grab,” Pysaruk said Russia should be responsible for all costs, including compensating Ukrainian banks for their losses. “The simplest way, if you ask me, would be for the Russians to pick up the check for everything,” he said.